Pixar scored a massive hit earlier this summer with the emotionally charged Inside Out, and they’ll be back this fall to tug at our heartstrings with The Good Dinosaur. That’s a strong year, but they’ve never been ones to rest on their laurels. They’re hard at work on their next film, the Finding Nemo spinoff Finding Dory, and they just gave us some new details about the awesome cast of characters we’ll be seeing on June 17, 2016. Disney’s D23 expo just kicked off, and we’ve got one of our own there in person, and during the Pixar portion of the animation panel feeding us all kinds of new intel. The action of Finding Dory follows the daft, but sweet amnesiac Dory, a Pacific regal blue tang voiced by Ellen DeGeneres. One day, hanging around the coral reef, all of her childhood memories come rushing back and she heads off to find her family. Along the way she encounters a whole ensemble of new friends, and we just got some new details about a few of them. 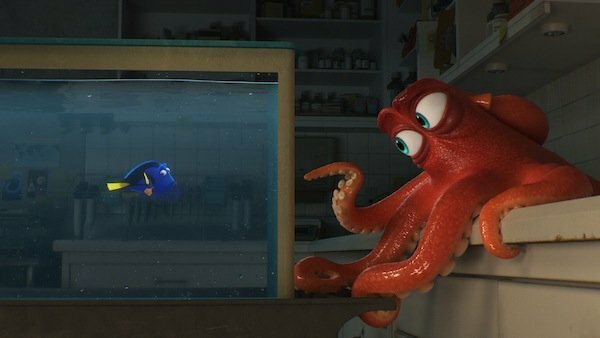 One of Dory’s new compatriots is a friendly Octopus named Hank. We knew that she meets him at the Marine Life Institute, and that he becomes her guide on this journey, but now we know a bit more. Most importantly, he’ll be voiced by Ed O’Neill from Modern Family and Married…with Children. We knew he was injured and at the institute so he could recover, but now that something happened and he only has seven legs. We’ll have to wait and see, but whatever trauma he suffered is bound to play into his emotional journey. 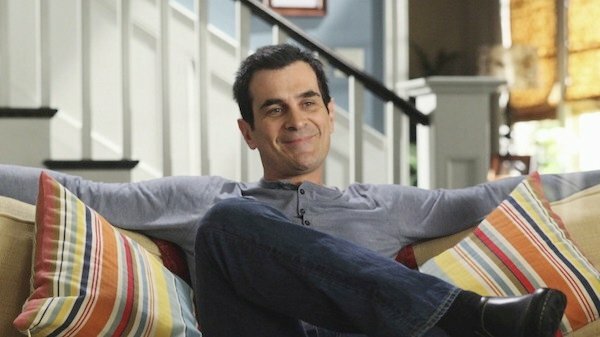 O’Neill’s Modern Family co-star Ty Burrell also gets in on the fun in Finding Dory. He voices a Beluga Whale named Bailey, and while that was previously known, we’re getting a sense of who he is and how he fits into this rag tag band of misfit weirdoes. Because of his oddly shaped head, they think he has a head injury, but that’s just how he looks. He also has "mad location skills" thanks to his echolocation abilities, and you can imagine how that skill set could come in handy along the road. Kaitlin Olson from It’s Always Sunny in Philadelphia lends her voice to Destiny, who is, according to earlier reports, Dory’s adopted sister. True to the rest of this colorful cast of characters, she’s got more going on than just this. According to what our man heard at D23, Destiny is a whale shark. It sounds like she’s having a bit of an identity crisis, as even though she is a shark—whale sharks are a type of filter feeding shark—she is under the impression that she is, in fact, a whale. This is indeed an awesomely strange array of characters and should make Finding Dory a lot of fun. And as you probably imagined, that’s not all Pixar has in store. True to form, they’ve put together a fantastic voice cast, including Diane Keaton and Eugene Levy show up as Dory’s parents, Jenny and Charlie. According to other reports, The Wire alums Dominic West and Idris Elba also stop by, though we don’t know anything about their characters just yet. We might learn more before, but if not, we’ll find out for sure when Finding Dory hits theaters on June 17, 2016.